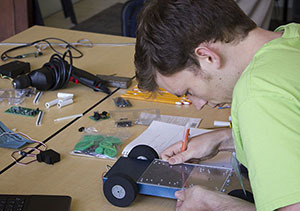 Caleb Schmidt (mechanical engineering) works on modifying a TekBot to retrieve and deliver a coffee cup. The inaugural hardware weekend (HWeekend) at Oregon State gave 19 engineering students a taste of creating a prototype under time pressure. Six teams developed their ideas as far as they could in 30 hours, starting in the morning of May 31 and finishing June 1. Hosted by the School of Electrical Engineering and Computer Science the free event was sponsored by Eaton Corporation that provided hardware and food. Mentors from Eaton Corporation and Hewlett-Packard were on hand to help guide the projects. “There are start-up weekends and app development weekends, but there wasn’t a program for something that covered the whole gamut of engineering, and included user experience. And I thought, ‘We can do that,’” said Don Heer, organizer of the event and instructor for the School of Electrical Engineering and Computer Science. The theme for the weekend event was automation and non-obtrusive technology. Projects were as diverse as a moving trash can, and a cane for people who are visually impaired that would vibrate the handle when nearby objects were detected. HWeekend participants had a “speed dating” session to get to know each other before forming teams. The teams formed after having a chance to interact with each other one on one. Students with ideas for a project wrote them up on a white board and other students shopped around for a group. 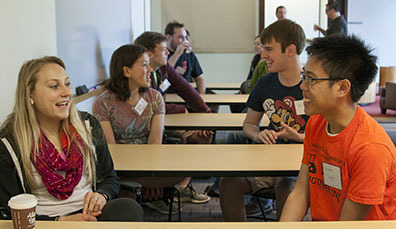 Cross-disciplinary groups formed with students from electrical and computer engineering, mechanical and industrial engineering, computer science and chemical and biological engineering. Cory Rea, a power systems engineer for Eaton Corporation who served as a mentor, said the weekend was a great way for students to get some real-world experience. “Every day in my job I work with a team across multiple disciplines — mechanical engineering, electrical engineering, sales, project managers. So, it’s important to be able to collaborate effectively,” he said. Hannah Marvin, a freshman in electrical in computer engineering, said she came because she wanted to make connections with students outside her major. Marvin was a winner of one of the “Ironman Awards” given to 17 students who stuck it out the whole 30 hours. “It went a lot faster than I perceived it would. It’s really cool looking at everybody else’s projects, so that makes it go by faster,” she said. And even after several hours with no sleep, she was still positive. 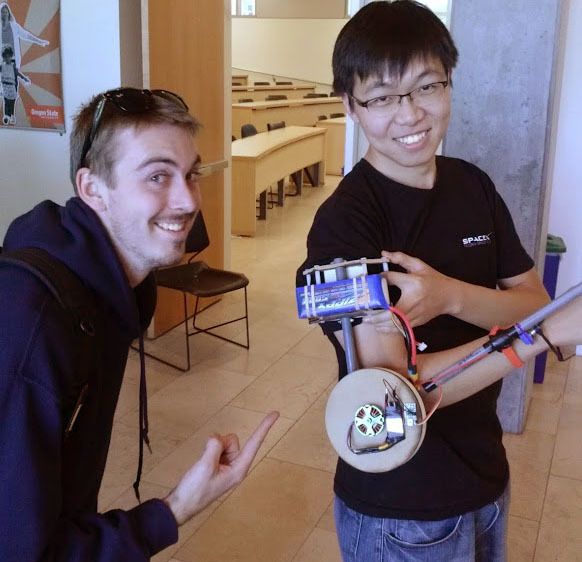 Ryan Skeele (mechanical engineering) and Soo-Hyn Yoo (computer science) show off their winning project. “It’s really fun! Everyone should have a chance to do this,” she said. It was a collaborative atmosphere where students helped out other teams when they could. One team stood out to win the “Helper Award.” Elliott Highfill, Travis Hodgin, Austin Hodgin, Max Schmidt, and Bradly Thissen worked on a project to play a game of tag with the TekBot robots, but were also a great help to the other teams by loaning tools, offering ideas, and help with coding. The top award for execution went to a team that built a device to augment the function of a human arm as an aid for people with limited strength or other disabilities. Kyle Cesare, John Fritter, Ryan Skeele and Soo-Hyun Yoo intend to continue to work on the project which they hope to eventually be an exoskeleton suit including both arms and legs that can be easily reproduced by others without highly specialized equipment. Heer hopes that events like these will show people how cool engineering is. “Engineers should be rock stars…they are the ones that make the world run,” he said. Working on team are great cause TEAM it mean Together Everyone Achieves More.